Tata responds to Hyundai’s new Santro with a new top-end variant for the Tiago with numerous first-in-segment features. Hyundai’s new Santro has taken the B-segment hatchback by storm by not just being an all-new offering but also by offering some first-in-segment features such as a touchscreen infotainment system, reverse camera and more. But Tata wasn’t going to just sit and watch, so in response, it has brought in a new top-end variant for its B-segment contender featuring new segment firsts such as projector headlamps, climate control and more. The Tiago falls in a category where a lot of first-time car buyers slot in. And one of the more important criteria of today’s generation of first-time car buyers is that a car should stand out on the design front and come loaded with equipment. Tata’s objective with this new XZ+ variant of the Tiago is to cater to exactly those demands. So, the new Tata Tiago XZ+ gets an optional dual-tone paint job that gives it a gloss black roof and rear spoiler, 15inch dual tone alloy wheels in the petrol variant only, there are two new paint shades on offer – canyon orange and ocean blue, there is a chrome garnish on the rear hatch and the car also gets new door trim mouldings. In terms of equipment, the XZ+ gains a new touchscreen infotainment system with Android Auto which also facilitates voice commands, a climate control system, electrically folding ORVMs and projector headlamps with smoked black bezels. 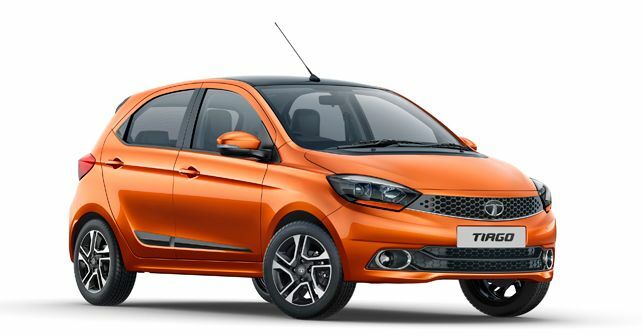 ‘’Since its launch in 2016, the Tiago - our first product to be launched under the Impact design language; stood out as an attractive, innovative and feature loaded car. It has been the most awarded car of the year with over 18 awards in 2017. With its continued demand amongst our customer base, we are today proud to announce the introduction of the new top of line variant in its range – the Tiago XZ+. Offering features and styling from a segment above, we are confident that the XZ+ will be much loved by our customers and will further help us expand our market share and support in our journey to ‘win sustainably’ in the PV business,’’ said, SN. Barman - Vice President, Sales, Marketing & Customer Support, Passenger Vehicles Business Unit, Tata Motors.